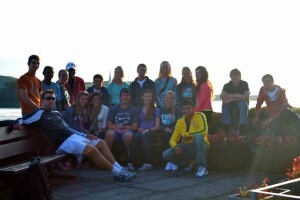 The Newks European Touring Team 2011 was a time all members will never forget! It will be a lasting memory of a time and a place never to be repeated! The tennis at Wimbledon was amazing! We watched Nadal and Djokovic explode through the draw! From the atmosphere in the “queue” ( an English word for “line,” waiting for Wimbledon Tickets) to the tube rides, to the constant tennis celebrities in and around Wimbledon, there was constant excitement for the team! 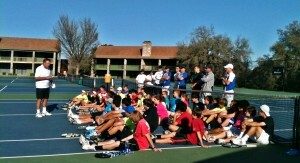 The good will that the John Newcombe Tennis Ranch instills in people around the world is amazing! We stop in Liverpool where the Palmerston Club looks after us like their own members. The kids meet English players, particioate in clinics, play matches and compete against each other. The Club has hundreds of members ranging from tiny tots to adults. Liverpool, the home of the Beatles, is always a special place for all of us! The new destination on the Touring Team map this year was Hamilton, Scotland. An outlying suburb of Glasgow. We trained and played matches at a first class facility called the Esporta club. The kids and I had our first opportunity to play on indoor carpet! Some of the highlights included a jog to the peak in Hamilton where we could see over the entire town. Another highlight was the Mexican food at one of our team dinners, which was surprisingly good being so far from Mexico! Oban Scotland as usual was the prettiest place on our map. This is a picturesque bed and breakfast town, where the best players in Scotland come to battle it out. It is always a great experience for our kids! This year, our own Kaysie Hermsdorf made the final of the Open ladies singles. The first time this has been done by a member of the American team.